If you're reading this, you're likely part of what we loosely refer to as the [SDL] Tridion [Technical] Community. You might sell, implement, or support Tridion. You might actually be a customer. But with our powers combined... we umm... help customers. 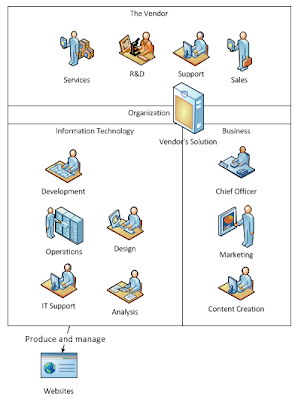 We serve customers, specifically enterprise technologists. If we do that well, you benefit. "You" might be a content author, an IT resource, a consultant, an chief executive, or even sales. To help those enterprise technologists, what do you know now that you wish you knew when you started with Tridion? *What enterprise-level organization doesn't already have an existing website? We serve the enterprise technologist who's likely well-versed with proprietary systems, databases, programming, and a few third-party systems. He's smart but new to Tridion or she may have already extended others systems. 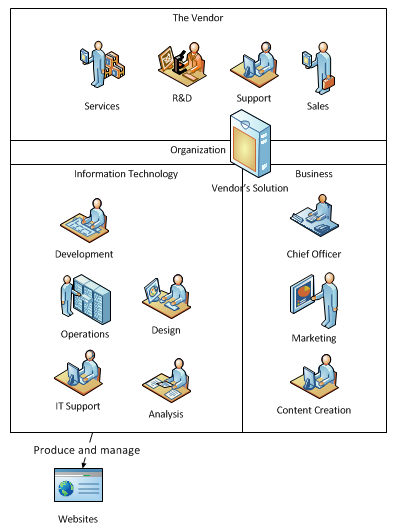 That technologist might serve in a variety of roles or titles (business analyst, developer, IT, etc), but he's typically the one who either asks for the Vendor's Solution (Tridion) or gets the notice that starts with, "hey, you know that CMS problem you needed help with..."
Generic-enough diagram to not give away any strategic secrets, but consider how you can help the bottom-left Information Technology box. Also notice the number of little icons. There's room in Information Systems/Technology for a variety of roles, come on in, the water's warm. Help IT solve their problems and we'll strengthen the community, the software, and ourselves (7 wins, actually). Tridion community content has exploded in the last two years. I love the information on the new things we're (you're) learning about SDL Tridion. But what about the new customers? What about the new projects, implementations, and upgrades that could benefit from your experience? Consider the Tridion R5.2-using customer who's upgrading to 2011. Consider the XSLT-focused organizations looking at modular templating for the first time. Don't assume you don't have anything to contribute. Don't assume it's all about extensions (though they are pretty cool and I wonder how I'll keep up with that guy). Since what's old is new again here's my challenge for you. What are 5 things you know now that you wish you knew when you started with Tridion? Here's my list. Pass it on, whenever or wherever you read this take a moment to blog, comment, or otherwise share your lessons for the next or future enterprise technologist. Some find modular templating simple but content delivery hard. No one knows everything, but the ones that seem to know a lot keep pushing, learning, and helping others. <xsl:copy-of select=". "/> is GPS for XPath and XSLT development. Can I trade-mark this? Webpage metadata != page metadata (at least not necessarily). Up until recently I never even touched page metadata, but thanks to some subtle points from Señor Strategy, I can now envision the content even in the markup (which implies component and not page metadata). Like Neo. This method goes way back. It's even on one of the oldest posts on the TridionWorld forum. #IWishIKnewThen <-- care to start a Tridion-Tweet meme? Yes, you can brag, boast, or bitterly recall missed opportunities. Give yourself permission to share a little or a lot. And if you don't have a blog, go ahead with 5 tweets.